The Web Operated Robotic Machine (WORM) project was designed and implemented by a team of 4 people. Each of the team members works on every aspect of the project. In addition, each team member was directly responsible for certain aspects of the project. Below are the names of the 4 team members that were assigned to the WORM project. Click on any of the names to learn more about them and their roles on this project. Each team member has included comments regarding working on this project and an e-mail link in case you would like to contact them. 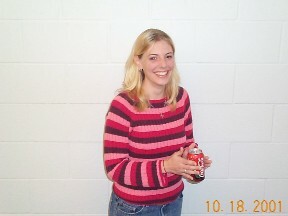 As a Computer Science (CS) major at Southern Illinois University Edwardsville (SIUE), each student is expected to complete a senior assessment. The senior assessment for the CS department consists of 2 classes taken in succession, CS425-Software Project Development followed by CS499-Senior Project. 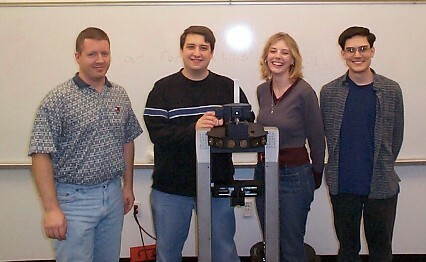 The WORM project began as a senior assessment project in the Fall of 2001. CS425 is the design phase of the senior assessment. The class was initially divided into groups of 3-4 people based upon experience and interests. Projects were then assigned to the groups. Our group was given the task of creating a web application to allow the public to control a robot recently purchased by the SIUE School of Engineering. In addition, the group was to use the web application as a tool to educate the public about robotics and the challenges of progressing through such a project. In CS425, the team performed significant research on the problem and then designed a solution. The final phase, CS499, is the course where the design was actually implemented. This course is designed to allow the students to implement the skills acquired over their educational career. The programming, testing, and delivery of the project would have to be completed by the end of the semester. Students are given an extremely flexible schedule so that they can concentrate on making a successful project. Project Manager: As the project manager, Erin is the leader of the team. She is responsible for ensuring that the team is progressing according to schedule. In order to do this, she must know what everyone else in the team is working on and how close they are to finishing. If problems arise, she is the person that will attempt to fix the situation. She has the option of getting others to help in order to finish on time or revising the schedule to make the timeline more accurate. As a project manager, Erin must report to the upper management to report on the progress of the team and their current status. Documentation Control: Each senior project is responsible for creating and revising numerous documents. To be specific, the project is required to maintain documentation on the Problem Description, Requirements, Project Plan, Design, Ethical Standards, Customer Contract, Coding Standards, Status Reports, Post Project Retrospective, User Manual, Testing Specifications, and the Application Code. As you can see, there is a lot of material which needs to be standardized and organized into a single location. Erin is responsible for ensuring all of the documents are properly formatted and organized. Lead Analyst As the lead analyst, Keith has the primary responsibility of defining the problem to solve. After the initial assignment of the problem, a more detailed description was needed. The team needed to know exactly what the client wanted to get from the application. Numerous client interviews served to define the full scope of the application. Due to the educational nature of this application, interviews were also performed with potential customers. Children ranging from 3rd grade through High School were interviewed to determine the features the application should support. Once the problem has been fully defined, the team could begin the design process to determine the best way to go about solving the problem. Lead Interface Designer: The interface is the part of the application that the user sees and interacts with. A good design will allow the application to be easy to use and enjoyable. Keith was primarily responsible for ensuring the application was self-explanatory and easy to navigate through. Prototyping sessions with children allowed the team to design the page layout and navigation so that everything made sense and flowed smoothly. A good design allows a smooth transition to implementation. Primary Client Point of Contact: As the person in charge of defining the problem and designing the appearance of the application, Keith was the logical choice for the primary point of contact with the client. This position entails keeping the client up to date with current ideas and plans for the project. The close communication with the client ensures that the team is building an application to their exact specifications and that there are no surprises when the project is completed and turned over to the client. By allowing Keith to be the primary point of contact, the client had contact with the team member intricately involved in defining the client needs and the appearance the application would be taking. Lead Implementation Designer: The design phase of the project is one of the most critical aspects of a successful project. Without a good design, the team would spend countless hours writing unnecessary code. As the lead implementation designer, Andrew had to figure out how the application was going to work from a programmer's perspective. Without worrying about the appearance of the application, he was concerned with how communication would take place and exactly what type of information needed to be sent and stored. The implementation design entails researching current technologies and determining the best language to write the code in and the most efficient formulas for calculations. By the end of the design phase, the application was laid out like the blueprints of a building. The programmers could go straight from the design into the coding of the application. Lead Programmer: As the lead programmer, Andrew is the person responsible for ensuring all of the underlying code is written. This application is much more than a typical web page. In order to control the robot over the Internet, a significant amount of code must be written for communication, sending commands to the robot and receiving information from the robot. 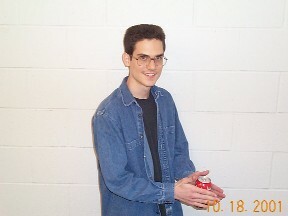 Andrew is responsible for assigning programming tasks to other group members. Based on the implementation design, the code is written in small segments, known as modules. This allows future teams to more easily maintain the application and make modification. Also, this allows the programmers to code small segments rather than large applications all at once. Once all of the modules have been written, Andrew is responsible for ensuring that everything is incorporated into one large application ready for testing. Lead Tester: As the lead tester, Greg is responsible for ensuring the application works the way it was designed to work. Every module that is written and every combination of modules must be tested for accuracy and reliability. In order to prepare for testing, Greg initially designed a test plan. This plan included the outline of when, where and how testing would take place. The team had to have set guidelines to ensure every portion of the code worked the way it was designed. 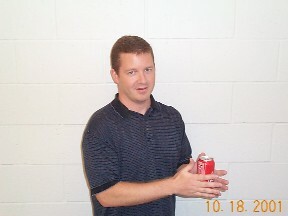 As an additional task, Greg designed specific test scenarios. When the team was ready for testing, a guideline would already be set up with numbers and scenarios to run in order to speed up the testing process. 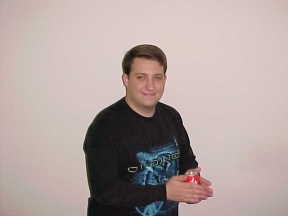 As the lead tester, Greg performed the majority of actual code testing. He ran modules of code against the test data and checked the results and performance against anticipated values. As modules were combined together, he tested the communication between the modules and the information sent back and forth. By the time the application was ready for release, Greg had ensured that the application would perform exactly as designed with the performance characteristics specified during the design.